His professional career began with Ternana in Serie B. After three years with the Rossoverde, he signed for Udinese on 27th January 2008 and made his Serie A debut against Inter. Livorno, Juventus, Parma and Cesena were clubs went out on loan before he went to Lazio in January 2012 from the Friuli club. On 1st February of the same year. he made his debut for the Biancocelesti and it marked a new start for Antonio. 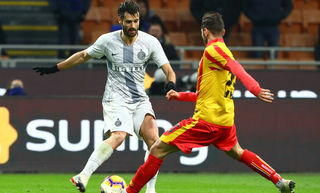 A number of personal achievements followed as he scored in the Rome derby, his international debut and first Italy goal, his first Serie A brace and 300 appearances as a professional. His Lazio career ended with 192 appearances, 45 goals and 45 assists. 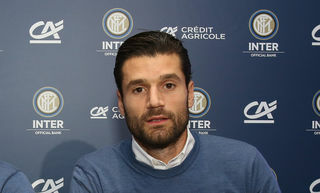 Candreva has shown himself to be a complete midfielder. Starting off as a trequartista, it’s the right wing position that he’s made his own. It was the position where he was abile to make the most of his dribbling, shooting and crossing abilities. In August 2016, he moved to Inter. On 21st August, he played for the first time with the club in Serie A and his first goal came on 20th October. In that season, he was able to score against Milan in both league fixtures. In 2009, he was called up by Marcello Lippi’s Italy for the first time and on 14th November he started for the first time against the Netherlands. He took part in the 2014 World Cup and EURO 2016. His first goal was in a qualifier for EURO 2016 on 16th November 2014, five years after his debut for the Azzurri. 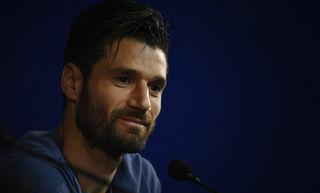 UEL, Candreva: "We want to go as far as possible"
Candreva: "We want to reach the latter stages of the Coppa Italia"
Candreva: "We're sure of our own abilities"